DESCRIPTION Situated within a private GATED CUL-DE-SAC close to the centre of Storrington is this two bedroom terraced home. The property is just under 4 years old and has the benefit of the remainder of a 10 year NHBC warranty. Features include, hall, downstairs cloakroom, good sized inner hallway, living room with FEATURE OPEN FIREPLACE with solid fuel wood burning stove and outlook onto rear garden, RE-FITTED KITCHEN/DINING ROOM with integrated appliances. To the first floor there is a good sized landing, two double bedrooms and family bathroom/shower room. Outside the property has a manageable rear garden with own access back to the front and the property also has its own car port. Early viewing is advised to appreciate the well presented accommodation and location to the village. ENTRANCE HALL Double glazed windows, radiator, coat hooks, tiled flooring. DOWNSTAIRS CLOAKROOM Double glazed window, low level push flow w.c., wash hand basin set into vanity unit with cupboards under, wall-mounted fuse box, chrome heated ladder style towel rail, tiled flooring, space for tumble dryer. LIVING ROOM 14' 4" x 13' 0 to side of fireplace" (4.37m x 3.96m) Feature open fireplace with solid fuel wood burning stove, slate hearth and wood mantel over, double glazed window, radiator, oak wood flooring, double glazed double opening doors with double glazed side panels leading to rear garden. RE-FITTED KITCHEN/DINING ROOM 14' 9" x 9' 9" (4.5m x 2.97m) Extensive range of re-fitted wall and base units comprising: one and a half bowl single drainer sink unit with wood block working surfaces, integrated 'AEG' fan assisted self-cleaning oven and grill with inset five ring gas hob with glass and chrome extractor over with downlighting, back plate, eye-level cupboards, integrated fridge and freezer, built-in storage cupboards, separate integrated freezer, built-in carousel unit, integrated dishwasher and washing machine, tiled flooring, concealed spot lighting, uPVC double glazed windows overlooking rear garden. 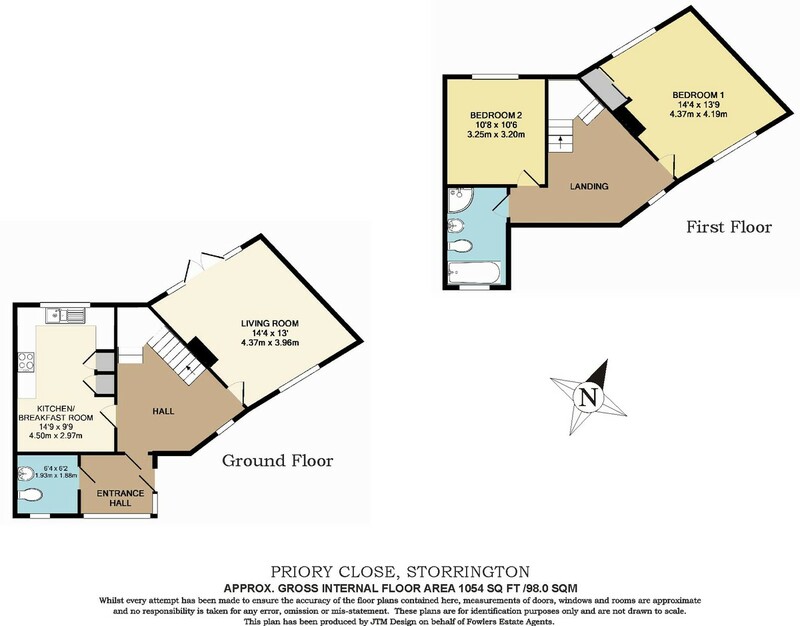 FIRST FLOOR LANDING Irregular shape, large landing space, radiator, double glazed window, hatch to part boarded and fully insulated loft space with pull down loft ladder. BEDROOM ONE 14' 4" x 13' 9" (4.37m x 4.19m) Double aspect double glazed windows, radiator, built-in sliding wardrobe cupboards with hanging rail and shelving. BEDROOM TWO 10' 8" x 9' 11" (3.25m x 3.02m) Double glazed window, radiator. BATH/SHOWER ROOM Circular shower cubicle with hand held shower attachment and overhead drencher, white suite comprising: low level push flow w.c., pedestal wash hand basin with mixer tap, panel enclosed bath with hand held shower attachment, fully tiled walls, double glazed window, ladder style chrome heated towel rail, tiled flooring, shaver point. FRONT GARDEN Various flower and shrub borders, enclosed bin storage, paved pathway, cupboard housing electric and gas meters. REAR GARDEN Fully paved along the full width of the garden, two raised beds with flowers and shrubs, 5 pleached Hornbeam trees, outside tap, enclosed by fence panelling, gate to rear access which runs round to the front of the property (ideal for bringing large items into the garden). CAR PORT 16' 7" x 8' 5" (5.05m x 2.57m) Located opposite the front of the house, one of a bay of four space, storage above, lockable rear storage room for garden tools etc., with shelving.